Pioneers in the industry, we offer empty pet cans, dry fruit transparent clear pet cans, empty cans for dry fruit, plastic easy open end pet can for dried food and empty dry fruit storage pet cans from India. PET Cans provide the extra edge in packing where the Cans are Transparent and dry fruits are visible. 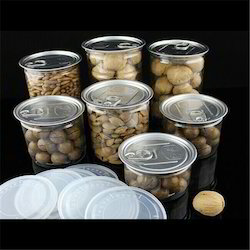 PET cans are also suitable for packing dry fruits with honey. Lids are Easy to Open and provides Good Shelf Life. We provide plastic lids so that once the seal is broken the customer can Reuse the cans. PET Cans are Light weight therefore it reduces the cost of packaging in cartons and transportation. PET Cans are Transparent which enhances the customer satisfaction and allows the customer to build a trust on the Seller. PET Cans are 100% Recycle able. Sizes available for dry fruits in grams: 50, 75, 100, 125, 150, 175, 200, 250, 350, 400, 500 grams. We can make customized sizes as per customer requirement.